One of the highlights of E3 week for me personally was a behind the scenes look at the upcoming Shadow of the Tomb Raider, that took place as part of Geoff Keighley’s Coliseum coverage. It was an interview with some of the game’s development team as well as performance actors, Camilla Luddington and Earl Baylon. 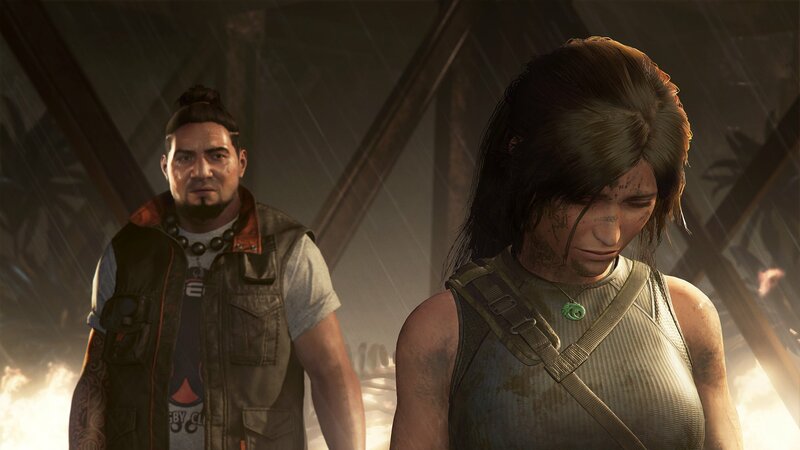 During the talk, fans were given insight not only into how things have changed for Lara and her friend, Jonah, but also how the series itself has evolved with a purpose and focus very different than the previous two games. The developers rebuilt the lighting system to give the atmosphere an extreme realism. Light will go through the water, showcasing light and dark tones. The lush jungle atmosphere is also quite detailed, with leaves moving gracefully when they catch the wind. In this world, Lara is surrounded not only by human enemies, but those who live in the jungle. She must become one with her environment, using anything and everything at her disposal. She must tap into her every skillset, fearlessly facing even the most daunting of enemies, as showcased in a game trailer moment, where she’s within inches of a ferocious jaguar. This time around, Lara is a confident, experienced woman who knows who she is and what she must do. In fact, she’s so narrowly focused on stopping Trinity that she sometimes forgets that her mission has consequences for those around her. Her obsession also causes her to make a lot of mistakes, including setting the apocalypse in full motion when trying to stop Trinity from getting their hands on a certain artifact. Although heroic and mostly meaning well, Lara is very much human and full of flaws. She also suffers from PTSD (Post Traumatic Stress Disorder) due to everything she’s been through. As much as Lara may hate Trinity and what they’re trying to do, she can’t help but have moments where she can see things from the point of view of the game’s main antagonist, Dr. Dominguez. This is because the developers have tried very hard to make him multi-dimensional, with his own interesting perspective, that, although extreme, isn’t completely unwarranted. In the end, no matter how many adversaries Lara may cross, her biggest enemy is herself. Lara’s confidante, Jonah, has evolved over the years alongside Lara. He’s become Lara’s moral compass and protector. He’s cautious to a fault, thoughtfully thinking things through, which causes friction at times with Lara’s impulsive attitude. Jonah is quick to tell Lara when he disagrees with what she’s planning to do and attempts to keep her in check by reminding her how her decisions will affect others. In order to capture a true friendship between Lara and Jonah, the game’s director allowed a lot of leeway and improvisation in the performances of the two main actors, Camilla and Earl. The twosome were constantly playing around with scenes, trying out subtle movements and working hard to bring in the needed emotion, to make their relationship as real as possible. You can take a look at a sampling of their amazing and gripping performance on the E3 Coliseum YouTube channel. The scene starts at 7:04. (You can also watch the whole 24 minute panel if you have time). An important goal of the developers was to not create a game that constantly rewards players, making them feel like an unabashed hero. Instead, they created characters and an environment where players feel quite challenged. They also worked hard to give players the opportunity to walk in the shoes of a very real protagonist who has emotional baggage and tough decisions to grapple with, just like anyone else. For those concerned that a new take on Lara Croft means less tomb raiding, the developers promise that there will be more tombs full of dangerous puzzles and deadly obstacles than ever before. In case you’re wondering about the game’s difficulty, a demo playthrough done by IGN.com, reveals that there will be varying levels of play. An easier mode will be offered to those who wish to have some hints and help. Or, you can experience the game at a harder setting, making it through completely on your own. Shadow of the Tomb Raider will release for the PC, PS4, & Xbox One on September 14th. You can pre-order the game on-line at Amazon, GameStop, Target, Wal-Mart, and Best Buy. If you’re a Lara Croft fan, who likes comics, Dark Horse has just released the first of a new, 4 edition series starring Lara and her next fight with Trinity, called, “Tomb Raider: Inferno.” Issue #1 is already available in stores. You can read a synopsis of it on the Dark Horse Comics website. Want to know even more about the game? Check out our article covering Shadow of the Tomb Raider DLC and future reveals. If you love to cosplay, be sure to take a look at our article that details Lara’s weapons and connects you to patterns for making that infamous Lara Croft tank top. The NES Classic is Making a Comeback!